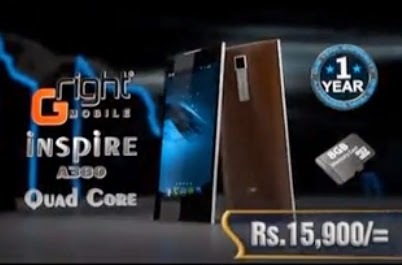 Gright smartphones are very reliable and less in prices GRight Inspire A380 Dusl Sim smartphone comes with all latest features like Android, Fastest browsing speed, Good camera result, Big screen, Flash Light, Long Battery Time. GRight Inspire A380 is most inspiring smartphone in reasonable price because it will inspired you on first look, when you purchase it you can feel the differences but if you want to load heavy games on it only than it makes problem. 5.0 inches screen size with 540 x 960 resolution Android OS version 4.2 Jelly Bean, 4 GB built-in Memory with support of microSD card up-to 8 GB, 1 GB RAM, Quad-core 1.3 GHz with ARMv7 Chipset, GPU (PowerVR SGX), Bluetooth, USB, WLAN, GPRS, EDGE, Dual Sim. On back side it has 8 Mega-Pixel camera with 3264 x 2448 pixels and features are auto-focus, LED flash, Touch focus, panoramic photos, smile shutter, HDR high dynamic range camera and on front side you can find 3.2 Mega-Pixel camera for video calling. Facebook, Games, Skype, Whatsapp, Installed Play Store, Built-in Games Like Temple Run, Racing Games, MP3, Videos, Radio.